Whenever you start thinking about retirement planning, it is worth beginning by working out how much income you are likely to need. Generally, few people need as much income in retirement as they did when they were working; the mortgage might be paid off, children are likely to have left home, and your general day-to-day expenses may have fallen. Nevertheless, the anticipation of increased leisure time might spur you to make ambitious plans for travel or family, and all these expectations have to be considered if you are to set realistic targets. Once you have calculated how much money you will need in retirement, you can then work out where it will come from. For example, the flat-rate, single-tier basic state pension is £159.55 per week (for 2017/18), plus you may have money coming in from Individual Savings Accounts (ISAs), rental income from a second property, or even some paid employment. Having made your plans, you should have a clearer idea of the income you will need to generate from your pension savings. 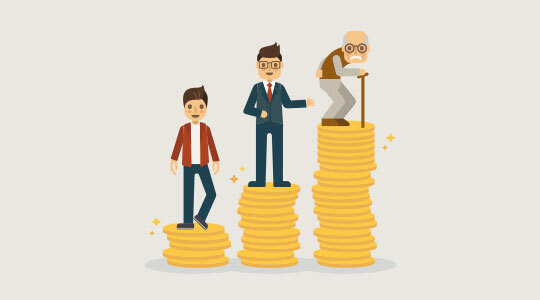 You might already have started to save through a workplace or personal pension scheme; however, although existing pension savings should be taken into account, it is likely you will need to continue to build them over your remaining working years. Just to give you an idea, a pension fund valued at £100,000 will buy a 65-year-old an annual income of less than £5,200, with no built-in guarantees. If you wish to retire earlier than that, the cost will be even higher. The amount you need to save could, therefore, be considerable. You can invest up to 100% of your annual earnings in your pension savings, subject to a maximum of £40,000 (for 2017/18) and tax relief is available on the contributions. There is also a maximum limit on the overall size of the pension portfolio you can generate – although at £1 million for the current tax year, there are relatively few people who are affected. Nevertheless, your savings don’t all have to be locked away in a pension plan. If you need – or would prefer – some flexibility over your access to your savings, Individual Savings Accounts (ISAs) can be a useful addition to your plans (subject to your personal tax position) and you can save up to £20,000 into an ISA during the current tax year (2017/18). For further information on planning for your retirement and other financial services, please contact Gary Nixon on 01274 465557 or email gary@tldallasifs.co.uk.